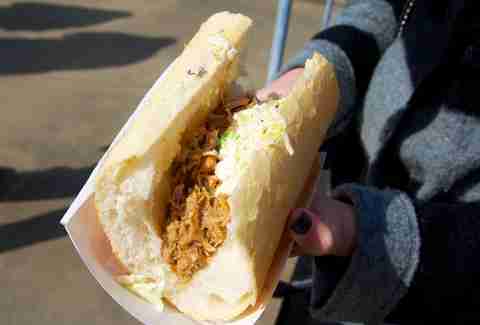 This past weekend was on the chilly side for New Orleans, but that didn’t stop upwards of 50k hungry bread-craving sandwich junkies from crowding Oak St for a chance to take a bite out of Po-Boy Festival. With 36 official vendors, plus the participating Oak St restaurants AND a new food truck area, it wasn’t easy to check out all the fare at the Fest, but sometimes, you just have to take one for the team. 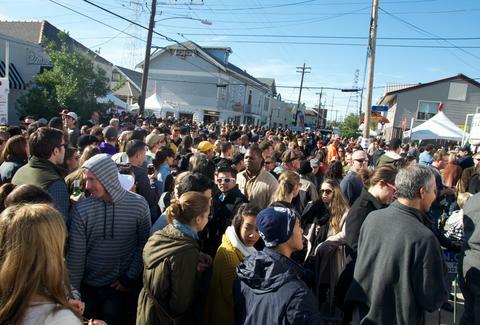 Here’s what Po-boy Fest '13 had to offer, if you couldn’t be there. 1. 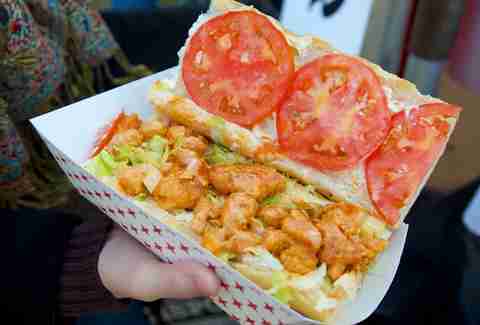 The day started off in line at 1030a for the most popular offering of the day (and of years past), GW Fins' fried Maine lobster po-boy. It was worth every painfully hungry second of the wait. 2. Then it was off to Mahoney’s for their BLT po-boy with roasted duck and arugula, and a small moment of tongue-transcendence. 3. You can’t make a decent po' without decent French bread, so the Leidenheimer bakery delivery man had his work cut out for him. 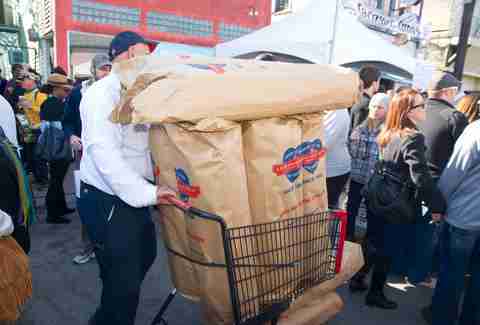 This hasn’t been scientifically tested, but if you stacked all of the loaves of French bread at Po-boy Fest end to end, they’d probably reach France. 4. 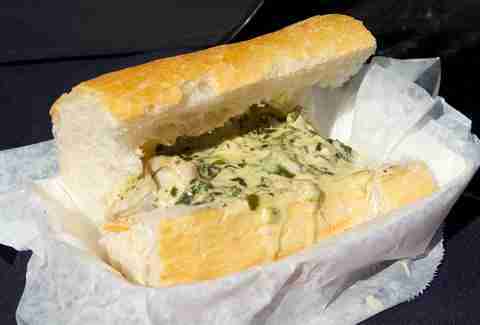 Perhaps the strangest offering of the day was Wayfare’s “Portuguese man-o-war” po-boy. No, it did not contain any lethal jellyfish-like colonial organisms. 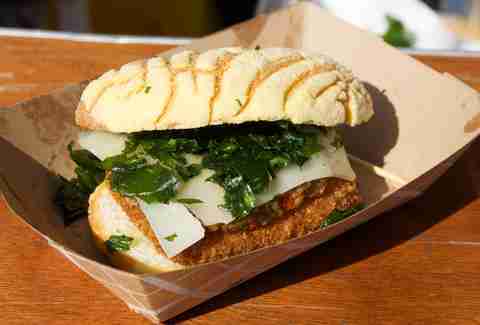 Rather, it was fried salted cod (bacalao) with chorizo, Manchego cheese, and arugula on a brandade cake. 5. 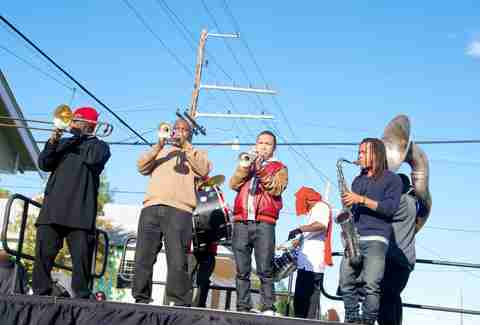 Of course, there was plenty of music -- three stages of it! 6. 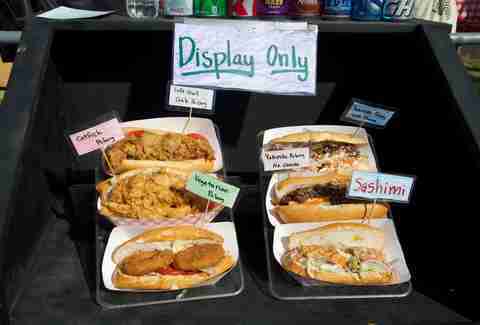 Ninja Sushi had six sandwiches in the game this year. 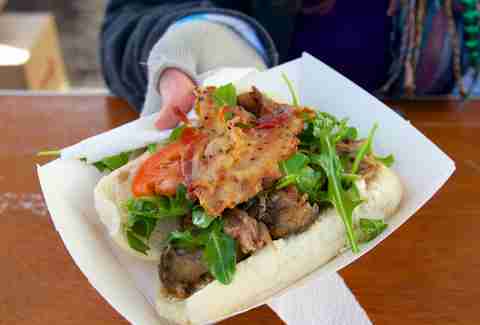 The fried soft-shell crab was outstanding... although the idea to offer a “sashimi po-boy” seemed somewhat questionable. 7. Oceana Grill cooked up an Oysters Rockefeller po-boy, which was exactly as rich and decadent as it sounds. 8. 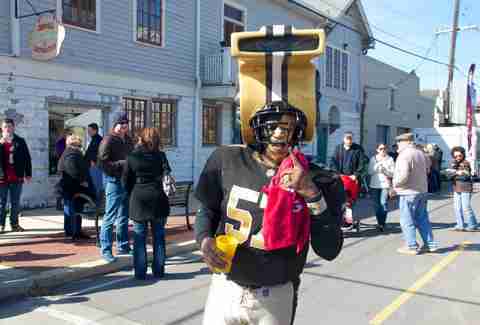 Even Saints superfan “Whistle Monsta” couldn’t help but get in on the sammy action. 9. 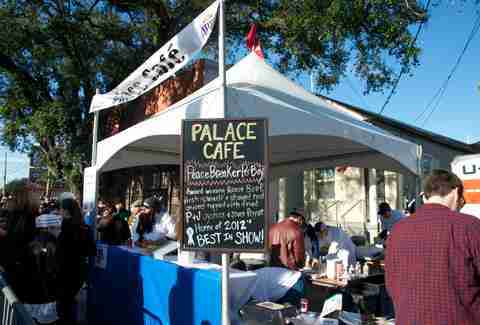 Over at the Palace Cafe’s booth, last year’s winning “Peace-breaker” po-boy made it back for this year’s fest: roast beef, shaved red onions, spinach, fried P&J oysters, and sauce foyot. 10. 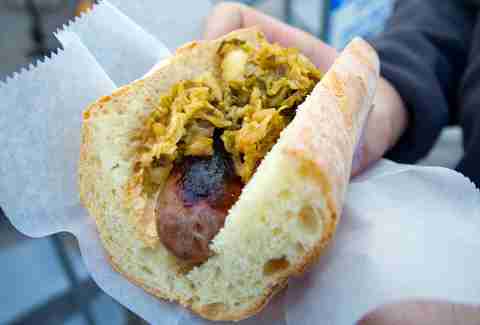 Slow Food NOLA partnered with Cleaver & Co. this year, cooking up a local chaurice sausage “Slow-boy” topped with spicy kimchi. It was eaten extremely fast. 12. 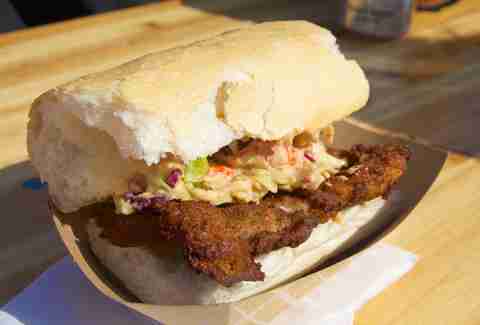 Bratz Y’all killed it with their wonderfully teutonic NOLA schnitzel po-boy. 13. 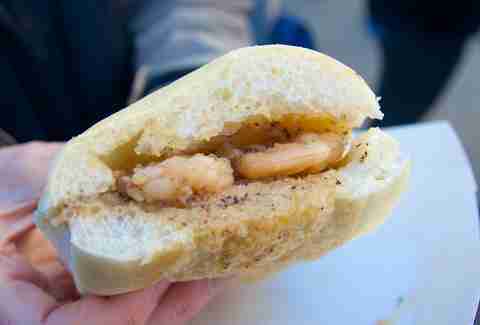 And of course Pascal’s Manale jumped into the fray by stuffing a loaf of French with their famous BBQ shrimp. 14. Speaking of BBQ, while NOLA-style BBQ shrimp has nothing to do with grilling or smoking, McClure’s Barbecue sure does. 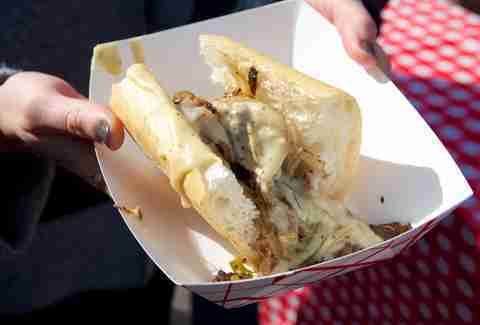 Their smoked brisket cheese steak was a serious contender. 15. A detour down Leonidas St would bring you to the food truck corral. 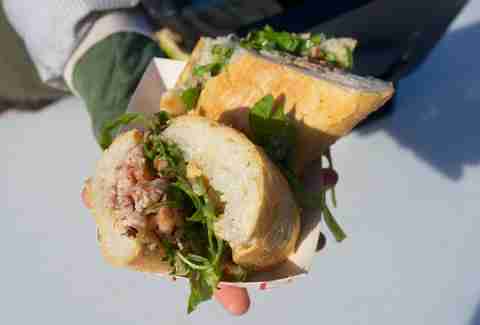 Foodie Call offered a porchetta po-boy (bacon-wrapped pork loin thinly sliced, and dressed with arugula and an apple vinaigrette), which easily kept up with the big boys. 16. 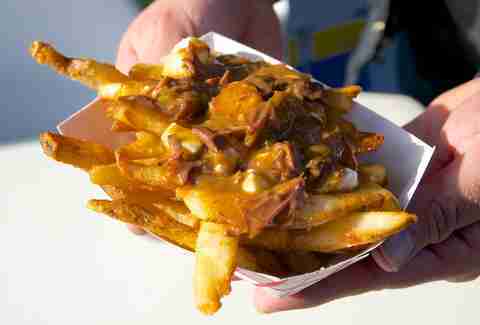 Oh, and if you were still hungry, there was roast beef “debris” poutine on hand, as well. 17. One of the day’s favorites was definitely the “smothered rabbit” po-boy from Voleo’s Seafood, which brought their game all the way from Lafitte, LA. Thank goodness they did that!